Hi, everyone. Today is a "busy" and happy day for me and my hubby. Its our 11th Wedding Anniversary as well as the General Election polling day in Singapore. So I started off my day with queuing up to cast my vote. Then a family outing to eat a happy meal and bring kids to Changi Airport to let them play at the indoor playground and slide. Tonight our eyes will be glued to the TV to watch the election results. Ha ha... Now back to "work". 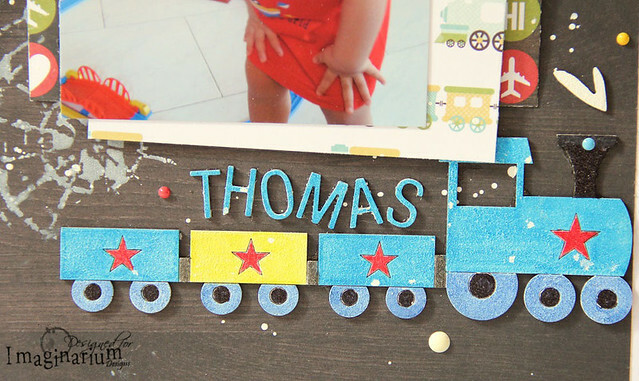 This month over at Imaginarium Designs, we are sharing our projects based on Kids theme. So I made a layout for my boy and his favourite toy, Thomas & Friends. I mat the pattern paper with a white cardstock. Flicked some white mists randomly across page. Inked over a stencil with white Mix'd Media Inx. Cut out the & and camera from another paper and pop them up with foam tape. Added some train cut outs. 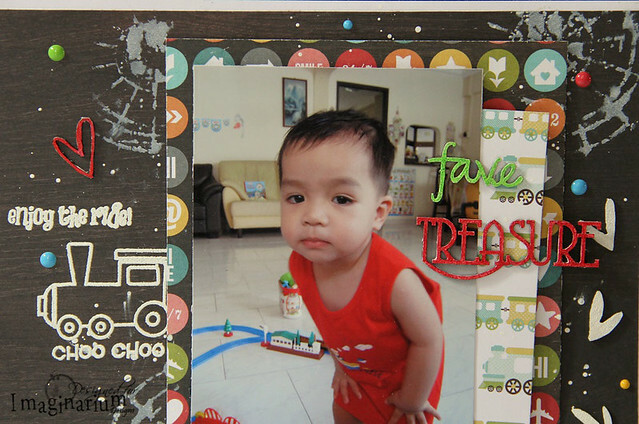 Also stamp and emboss in white the train and sentiment images. For the gear chipboards, I color them with Viva Decor Inka Gold-Graphite and layered them up. For the other chipboard shapes and sentiments, I gesso over them and colored them with Faber Castell Pitt Artist Pens and Sharpie markers. I love this train chipboard. Colored them as per Thomas train colors. Position the words, Thomas on top of the carriage and added 3 gesso hearts chipboards as the smoke. Ok. That's all for today's sharing. Do hop over to Imaginarium Designs to look at what my fellow team mates had created. And do leave a comment to win a pack of chipboards. Have fun.